When my buddy Tiff over at Who What Wear (they've just redesigned their website. Go check it out!) uttered the words Ryan Storer Swarovski ear cuffs into my ear, I feel madly and insatiably in love. 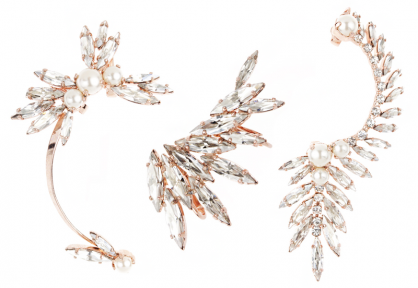 Ear cuffs are spring's hottest jewelry trend and Storer's immaculate collection of pretty floral bursts of crystal cuffs are the best of the best. Tiff and I impatiently counted down the seconds till the launch of Storer's e-shop. When that magical day finally came, we jumped online only to find out that each of the three pieces were already sold out. Since then, I've been refreshing the site on a daily basis hoping he'll replenish stock and mend my broken heart. On this day of love, I visited the site again, hoping to unite with my unrequited love. Heartbreak. But this love story is far from over. I will keep trying until I adorn my ear with a piece of Ryan Storer. Because the heart will always want what the heart can't get. Really quite beautiful....I can see why they sold out! I hope they will be back on stock....so that I will steal them frm you!! What a heartbreaking story!! I feel for you. And the earrings, of course. ;) Fingers crossed they reunite one day. SOON. Wow !!!! Let see my second outfit Post about Mangano!!! I wait you :-D Kiss from Italy ! eek i hope they replenish the stock soon and you snag one because they are gorgeous!! Haha, so sad. Hopefully you'll get one soon. They're gorgeous!